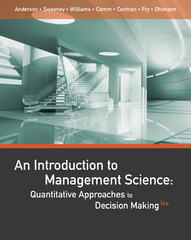 An Introduction to Management Science 14 Edition Reflecting the latest developments in Microsoft Office Excel 2013, Anderson/Sweeney/Williams/Camm/Cochran/Fry/Ohlmann's AN INTRODUCTION TO MANAGEMENT SCIENCE: QUANTITATIVE APPROACHES TO DECISION MAKING, 14E equips readers with a sound conceptual understanding of the role that management science plays in the decision-making process. The trusted market leader for more than two decades, the book uses a proven problem-scenario approach to introduce each quantitative technique within an applications setting. All data sets, applications, and screen visuals reflect the details of Excel 2013 to effectively prepare you to work with the latest spreadsheet tools. In addition, readers can get a copy of LINGO software and Excel add-ins with the book's online content.